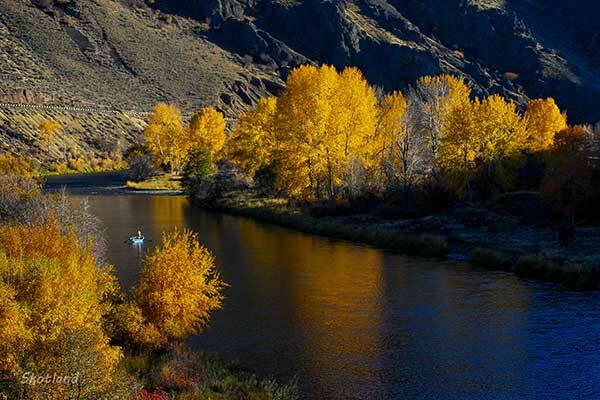 The Yakima is located in the eastern “dry side” of the Cascade mountains in Central Washington and is the longest river entirely in Washington State, originating at Keechelus Lake and flowing 214 miles to the Columbia river near Richland. Our home water is the 75 mile long Blue Ribbon section of the Yakima between Easton and Roza dam. The river flows from forest to desert in this stretch and is home to wild rainbow and cutthroat trout, abundant wildlife and amazing scenery. This catch and release stretch of the Yakima river, from Easton Dam to Roza Dam, can be divided into five different sections, the much smaller upper river between Keechelus dam and the confluence of the Cle Elum river, the upper flatlands near Cle Elum, the forested upper canyon below Cle Elum, the lower flatlands near Ellensburg and Thorpe and the Yakima River Canyon between Ellensburg and Roza dam. An average of 300 days of sun per year, combined with three reservoirs which insure good flows and cool water in the summer from Keechelus dam to Roza dam, provide an ideal environment where trout and trout food thrive. March: BWOs mid day and Skwala Stoneflies in the afternoon. March Browns are getting cranked up. April: Skwala and BWOs in the first week or two and March Browns are at their peak. Runoff can be an issue in the spring, but March and April generally produce the Yakima’s best dry fly action for big fish. May: Still a few BWOs followed by Mahogany Duns and the epic American Grannom (Mother’s Day Caddis) hatch. Salmon Flies in the upper river. June: Pale Morning Duns, Big Yellow Mays, Yellow Sallys, Terrestrials and a variety of Caddis. Golden Stones and Green Drakes in the upper river. The biggest variety of hatches of the year. July: Summer Stones and evening Caddis begin to emerge in earnest and Hoppers and other terrestrials become important menu items. August: Summer Stones, Hoppers and evening Caddis. The river begins to drop towards the end of the month as the annual ‘flip flop’ begins. September: The Yakima finishes dropping from summer to fall levels in the first half of the month. Generally the best nymphing of the year for numbers of fish. Summer Stones in the first few weeks followed by October Caddis and Light Cahills as the water cools. October: October Caddis, BWOs, Mahogany Duns and Light Cahills. Traditionally, the best small dry fly fishing of the year. 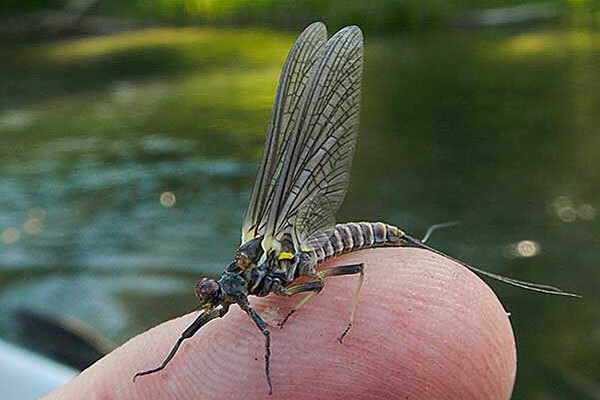 November: BWOs and Mahogany Duns until Mayfly hatches are replaced by Midges as water temps drop. December / January: Nymphs and streamers. Trout metabolism slows as the river cools, so they require fewer calories and eat less. Fish tend to congregate in or near slower, deeper water. Persistence in finding and working the fish is key in the winter. February: As the days get longer and water temps begin to rise, trout and trout food become more active. Trout begin to feed heavily as the water warms and spring spawning time approaches. Nymphing can be very good. Hatch size and timing can vary quite a bit from year to year due to weather, river conditions and other, more mystical factors. The descriptions above are based on 25+ years fishing the Yakima and are good but not absolute indications of what to expect month to month on the river.